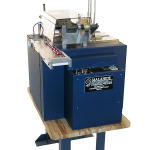 Malahide, a brand of Spartanics Ltd., is a leading manufacturer of professional grade hot stamping machinery. Successfully installed in over 35 countries, machines from the Malahide line of hot stamping equipment are commonly used to foil stamp products like : Paper & Plastic Cards,Printed Ribbon, Narrow-Web Textiles, Retail Packaging, Holograms and more. 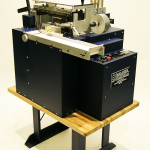 A Malahide Hot Stamping Press is distinguished by it’s high print quality, a quiet, all-electric mechanism, and a superior level of manufacturing. Hot Stamping is an industrial marking process best known for the shiny metallic gold or silver print it commonly produces. The process is also known as foil stamping, hot foil stamping, gold stamping, gold blocking, foiling, and gold leaf. Most people know hot stamping as the hologram on your credit card, the metallic gold printing found on cosmetics packaging, or in the picture, the gold printing seen on the poker chips. WHAT CAN BE HOT STAMPED? 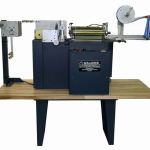 Hot stamping works by pressing a heated metal die against a colored foil and the product to be printed. Where the raised surface of the die touches the foil and product being stamped, the foil graphic is permanently transferred to product. The process of hot stamping employs 2 consumable supplies: foil & dies. Hot Stamping is extremely economical : Foil costs at around 5 square inches for 1 cent. If looking for model specific resources for you Malahide machine, please refer to the product models on the side. As always, you can contact us at anytime and we are happy to assist you with your Malahide!